Join us as we celebrate the Summer of Glass here in Asheville at our gallery in Biltmore Village! 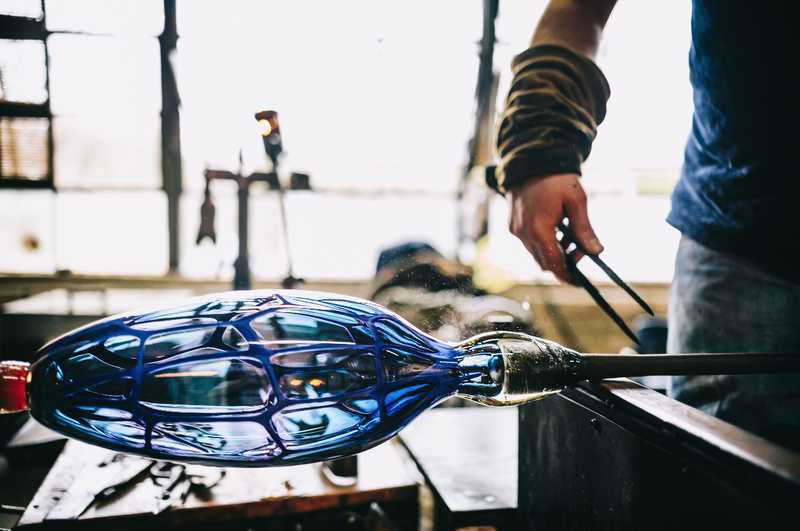 To honor the long-standing traditions of glass blowing, we will be hosting Southern Highland Craft Guild glass members David Wilson and Loretta Forde along with their son Hayden Wilson. From 2:30pm-5pm, these talented makers will be at the gallery talking about their processes and work. Wine, cheese and other lighter fare will be provided as well as live entertainment. David Wilson has been blowing glass for over 35 years. He has been a student and instructor at the Penland School of Crafts for several glass and experimental neon classes. Loretta Forde has also taken classes at Penland, as well as apprenticed to several local glass blowers. She has been teaching beginner glass classes since 1991 and presently offers classes through Mayland Community College. Together, they own and operate a glass studio in Burnsville, NC. They make a range of items from beautiful functional work, to one of a kind pieces. Techniques vary from blown glass and solid work, to sandblasted, neon and fluorescent glass. Their production items include tumblers, vases, paperweights and seasonal ornaments. Their larger work includes decorative plates, bowls, lamps and unique plasma sculptures to round out our wide variety of work. David and Loretta's son, Hayden Wilson, grew up around glassblowing in the mountains of Western North Carolina. He received his Bachelor of Fine Arts with a concentration in sculpture from the University of North Carolina at Asheville. As a second generation glass maker, he has been around glass his entire life, but working professionally as a glass blower and caster for the past six years. He has been an assistant instructor in the glass studio at Penland School of Craft, in Penland, North Carolina and also at Pilchuck Glass School in Washington state. Hayden has also worked Jackson County Green Energy Park building equipment, teaching glass and metal foundry classes. He currently works with glass artist Alex Bernstein and serves as the facilities manager at the North Carolina Glass Center, a public access studio that focuses on art glass making as well as offering an array of classes. Hayden creates his work at theNorth Carolina Glass Center. Hayden's work conveys his aesthetic of clean lines and inspired by modern, utilitarian design. He works with utilitarian vessels, as well as steel and cast glass sculptures. In addition to his own work, Hayden has also designed and created various lighting commissions for local restaurants and businesses in the region.